Mr. James C. Case making the first deposit in the Bank of Dade. George H. Harrison, President, looks on while Jack Hill receives the deposit. Taken from the HISTORY OF DADE COUNTY, GEORGIA as compiled and written by the Retired Senior Volunteer Program (1981). An organizational meeting for the purpose of organizing a bank of Trenton and area was held on February 22, 1955 at the courthouse at Trenton. After a lengthy discussion it was decided that a bank was needed and the name should be Bank of Dade. The following were elected to server as the bank’s first directors: George H. Harrison, Douglas E. Morrison, D. T. Brown, Jules C. Case, and R. S. Townsend. The proposed directors met February 26, 1955 for the purpose of electing officers for the first year. D. T. Brown was elected chairman, George Harrison, president and Col D. E. Morrison, vice-president. Col Morrison indicated that Mrs. Morrison would have a building errected on the public square and the bank would lease quarters in the new building. This was accepted. Application for the charter and deposit was signed and submitted to the proper authorities. In due course of time applications were approved. The bank opened for business on January 12, 1956. A dedication devotional was held by Rev. Robert Hilton of the Trenton Methodist Church, with directors and employees present, just before the doors opened for business. The Bank of Dade eventually moved to its current convenient location at the corner of U. S. Highway 11 and Georgia Avenue in the heart of Trenton’s business area where it has enjoyed a steady, consistent growth and is proud to have played a part, and to continue to play an even more important part, in the growth and development of Dade County, and the surrounding area. The article that appeared in The Dade County Times on Thursday, January 12, 1956. "Bank of Dade Opens for Business"
Dade County’s modern, new bank opened this morning with a great deal of interest on the part of local citizens. The first bank to open here since early in the century, the Bank of Dade will provide a great service to people of this area. President George H. Harrison, Vice-President D. E. Morrison, Secretary Jules A. 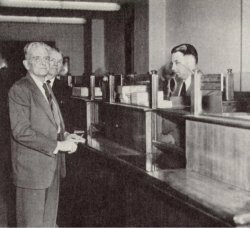 Case and Assistant Cashier M. J. Hale were present along with the other members of the board of directors to welcome the many visitors who came in to admire the new establishment and to open accounts: D. T. Brown, chairman of the board, and R. S. Townsend. Mrs. R. S. Townsend of Wildwood opened the first savings account and James C. Case of John L. Case Co. opened the first commercial account. Of interest is the fact that Mr. Case made the last deposit in the old bank before it closed for his father, the late John L. Case. Others took advantages of opening day to open accounts or to meet Presidnt Harrison, who will also act as Cashier, and Mrs. Herman Moore, who will assist with the business end of the bank. Col. Morrison, builder of the handsome new Morrison Building, in which the bank is located, accepted many compliments on th brick and steel building which his nephew, Roy Morrison, architect with the Cherokee Construction Co., designed. Three office spaces make up the ground floor, with five efficiency apartments to be built overhead. The bank occupies the right-hand space, next to Case Hardware, and is the only space completed at this time. Final details, such as painting the walls, and laying the tile on the bank floor, will be taken care of in the near future. The furnace, which will heat the entire building, has been delayed en route and has not been installed as yet. President Harrison has received congratulatory messages from banks throughout the state and adjoining states, wish for the Bank of Dade much success and good will. In visiting recently with officials of Chattanooga banks that have received a large amount of business from Dade Countians in the past, Mr. Harrison was assured that these banks were cooperating fully. 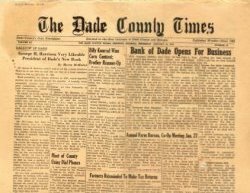 The Dade County Times joins other businesses and well-wishers throughout the county in welcoming the Bank of Dade as one of the most important advancements in the history of Dade County.